PRODUCT DESCRIPTION: Bacteria based spray that is concentrated and full of tiny micro organisms that are lethal to some insects which eat them. When mixed with water, this bacteria will sit active on plant surfaces and be ingested by any foliage eating insect. Once inside the digestive system, the insect will stop eating after a few days and then die. This bacteria is harmless to mammals and other more sophisticated animals like birds and people. 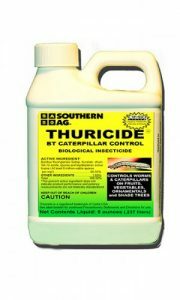 TARGET INSECT: Tent caterpillars, gypsy moths, tomato horn worm loopers and other garden variety insects. WHERE TO USE IT: On any plant which gypsy moths are likely to target as a food source. 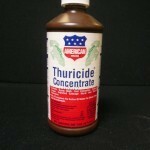 RATE OF APPLICATION: Mix 1 tablespoon per gallon of water and apply the gallon over no more than 1000 sq/ft. Since this can be hard to gauge when spraying plants, the rule to follow is to lightly mist the plant leaves to the point of runoff. Retreat weekly during the season. Bye bye tent Caterpillars! 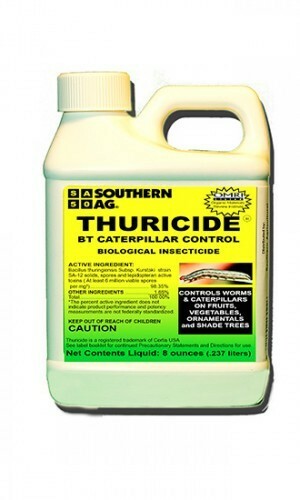 Your product was very effective on our large infestation of Tent caterpillars. My biggest problem is the height of the trees they're in because I don't have a sprayer that will shoot the poison 60-75 feet into the top of the trees. Quick delivery, packaged well, reasonable shipping costs. No Problems.